Across a dirt road from the main building at Bobiri Forest Reserve is a set of large, thick-trunked trees spread more or less evenly in an otherwise fairly clear patch of forest. 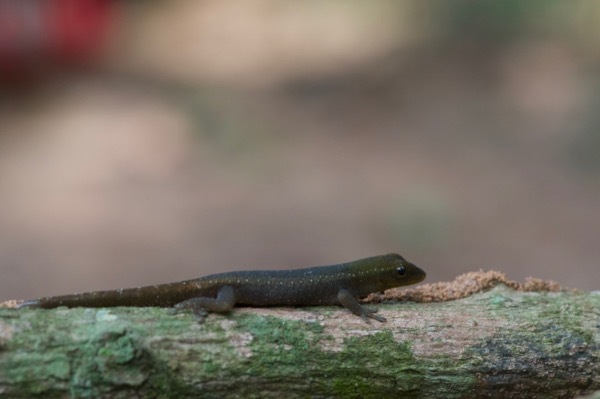 One morning Kurt spotted a tiny rainbow-colored gecko clambering up a trunk – head yellow, body turqouise, tail yellow blending to orange blending to red. Unfortunately it was moving quickly up out of camera range, and we caught it to prevent it from disappearing entirely. Its reaction to this undesirable turn of events was to lose all the beautiful coloring and transform into the nondescript dark lizard that you see here. We gave it some time to hang out on a branch from which it couldn't easily escape, hoping it would redisplay its gorgeous colors, but it was mad at us for catching it and refused to do so. We got some photos of it in its dull stress colors and then released it back onto the tree. You can get an idea of what it looked like when we saw it from Matthijs Kuijpers's photo of this species. 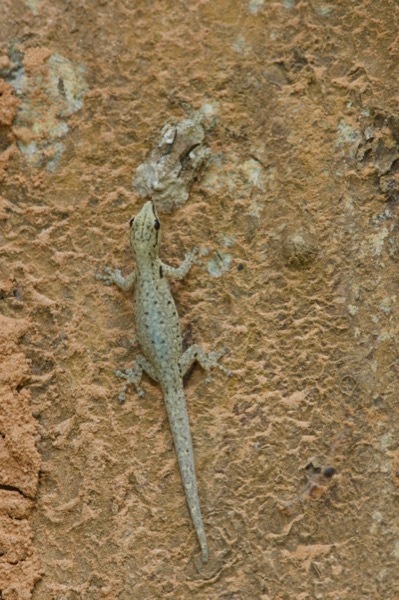 We saw a couple of these geckos on the same tree the next day, but the moment of glory had passed. This one isn't dark from stress like the one above, but it doesn't sport crazy rainbow colors either.